43.75 percent standing gain with max skills for Zainou biotech. 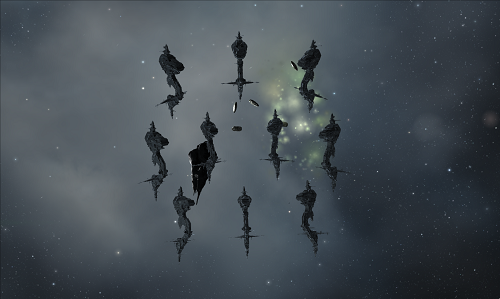 8.75 for Caldari state. 13 BS, 6 BC, 2 CR and 4 FR. Types the same though, i.e. no jamming etc. Especially heavy incoming DPS in the two auto-aggro groups (6 BS and 6 BC). So more difficult to tank than Gurista Extravaganza or Recon - Part 1. 14 million in bounties, about 2 million in loot. Ran it with a Caracal, no real threat. Just had to make sure I didn't fly into one group as I flew away from another, keeping the Battleships out of gun range. 2x Hornet drones (T1) used against the destroyers.